It has taken me literally years to purge my wardrobe and to find a style that reflects my present walk with God. When people meet me for the first time I don't want any doubts about who I am in Christ. Along with how I speak and treat others comes the manner in how I dress. I want to be able to witness to others without my appearance being a distraction therefore; modesty is the perfect solution. Modest dress includes not wearing hairstyles, make-up, and accessories that cause lots of attention AND OR wearing clothing that is inappropriate for the occasion (i.e, dressing too dowdy in a formal setting). Paul was explaining in 1 Timothy 2:9 that the women of the church at this time were more focused on out doing each other with their outward beauty and flaunting their ability to purchase expensive clothing than paying attention to the messages and teachings being preached and taught. Unfortunately, we see this same behavior in church today. Likewise, when you put yourself on display when witnessing your message can get overshadowed by your outward appearance. Who you're speaking to may unknowingly be more concerned with how you painted your intricate nail design rather than your message of salvation as an example. The key here is finding balance and remembering to always be presentable without going to either extreme –too flashy or too homely. Personally, what I've to realize is less is more. My minimalist lifestyle is not only reflected in my home and what I eat, but what's in my closet. I'm not pressuring you to become a minimalist because this lifestyle isn't for everyone, but ridding my life of clutter enables me to stay focused on the task at hand, ministering to women through Grace with Humility. It allows me to practice humility by not overwhelming myself with material possessions that will pass away in due time. Establish A Budget. You don't have to splurge and spend hundreds of dollars on new threads. Create a sensible budget and stick to it. Visit thrift stores, consignment shops and boutiques. You'll be surprised what you'll find. It Takes Time. Try not to rush into creating a new wardrobe. If you're like me it can take weeks, months, and even years to find the perfect piece(s). If you purchase a piece you won't enjoy wearing it will only take up space in your closet and cause you to spend additional money when you finally find your gem. Repurpose. Before throwing out an iffy piece, see if you can make it more modest or less dowdy by layering it with other pieces. I've saved a lot of money using this trick AND created new looks. Check out my YouTube video: 5 Ways to Wear Skinny Jeans Modestly for some ideas. You Don't Need Name Brand. Let's be honest, the reason why fashion mogul brands charge so much for their pieces is because of GREED! Yes, I said it greed. A luxury brand will charge a consumer a few thousand percent over the actual cost to make the piece to persuade you into thinking it's exclusive and high quality therefore, worth the price. This is the oldest marketing trick in the book. I've owned authentic, expensive hand bags, shoes, and jeans that could not stand the test of time. Don't fall for it. If you "must" wear high end, name brand clothing try visiting consignment shops or thrift stores before shelling out your hard earn money to an industry that rejects God and His statutes entirely, but I digress. Less Is More. I love minimalism and although that lifestyle may not suite everyone the old saying less is more, goes hand in hand with your wardrobe. Despite what society convinces women, we don't need an entire bedroom dedicated to our clothing, shoes, and accessories. That's called hoarding and is not becoming of a woman of faith. You can do wonders with a few staple pieces. For ideas watch my YouTube video: Basic Pieces for a Modest Christian Wardrobe. When your clothing and accessories take up all the closets in your home and your poor husband has one square foot of closet space you might be idolizing fashion. Your wardrobe should always be in a manageable state and never cause you stress when looking for something to wear. I'm not advocating you have one outfit if you can afford more, but let's not let our desire to dress our best get out of hand. If you're having a hard time with hoarding throw out your fashion magazines and unfollow social media accounts that encourage you to shop, shop, shop. Image courtesy of Pixabay. Edited by Grace with Humility. "Even the most beautiful things in the world can cripple your walk with God." If The Shoes Hurt Your Feet Let Them Go! The majority of women would love to own at least one pair of the infamous Red Bottoms. As nice as they may look what seems to be a common complaint is how terrible they hurt your feet. Some women have resorted to displaying the shoes as works of art and accent pieces because the mere thought of wearing the Medieval torture device brings them to tears. So why would a woman spend hundreds and even thousands of dollars on a pair of shoes that give her grief? The only reason I can think of is that she is idolizing a brand of shoe and in that case she needs a heart check. If this sounds like you, I suggest you stop the madness and only purchase shoes that are comfortable enough to wear for at least a few hours. And yes there are cute, less expensive, comfy shoes out there despite what Christian Louboutin and all the others may lead you to believe. Give To Charity. It's perfectly okay to sell some of your items, but it's even better if you can give them to someone in need for free. The Proverbs 31 Wife blessed the needy which demonstrated her beautiful spirit inside. Who's to say your $100 New York and Company button up top and pencil skirt you were ready to sell couldn't be given to a single mother who needs appropriate attire for a job interview? I want to mention if the article in question is worn, ripped, tattered, or stained I recommend tossing it. We should be mindful about what we give to charity. Even those in need deserve to look presentable just like you and I and out of respect we shouldn't pass down items even they would feel ashamed to wear. Always do a heart check. If It Displeases God Throw It Out. This may make a few of you readers click right out of this post to never return, BUT I must say it. The fashion industry is littered, no pun intended with leopard and animal print apparel. I got caught up in buying these pieces, but recently God convicted me about wearing said items. I wasn't exactly sure why He wasn't pleased so I did some research and found out leopard print attire is linked back to Egyptian cat worship among other unfavorable things like a woman's sensuality. Yikes! I may write an entire blog post on my discovery but until then, if you are curious or concerned do your own investigation. Therefore; instead of giving away my leopard and animal print clothing and accessories I threw them in the garbage. If God isn't pleased with me wearing it then WHY would it be okay for someone else to wear it? Can I say integrity? 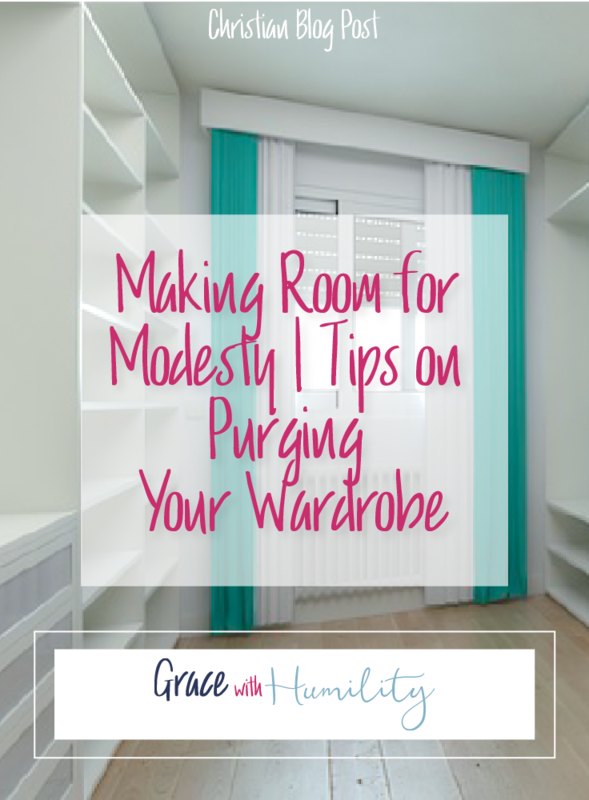 I hope my post helped you prepare for your closet purge in order to make room for more modest attire. Please share in the comments your biggest obstacle when decluttering your closet.